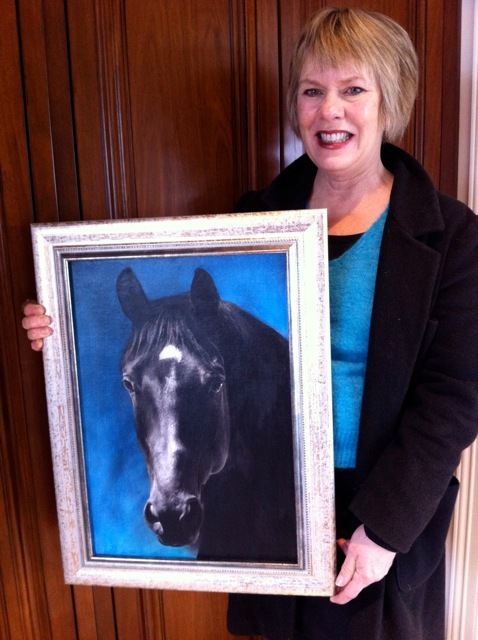 Last week Quailhurst received a special delivery when artist Eve Holloran visited the farm to deliver her completed portrait of Deborah’s beloved partner “Ferrogamo” (aka Zorro). Commissioned after his passing last year, Eve worked from a headshot of Zorro to create this stunning likeness. All who had the opportunity to know this exceptional horse remember his exquisite head and eye and unmatched, larger-than-life persona – both of which come to life on this canvas so much so that you almost expect him to nicker hello. Thank you to Eve for putting so much love into this very special portrait. More on Eve’s work can be found at Verybestportraits.com.